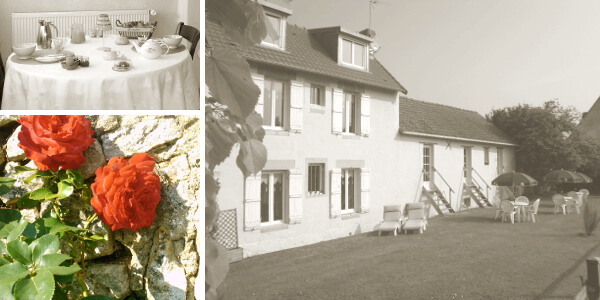 "The 4 Seasons" seaside guest rooms in Normandy, near the D-Day landing beaches! Along the Calvados seaside, at the very heart of the D-Day beaches in a small typical village located 20 mn from the historical cities of Caen and Bayeux, your guest house and its gourmand breakfast is waiting for you in a comfortable, natural and hearty setting. Enjoy your stay in a former farmhouse where 3 Gites de France 3 ears of corn approuved guestrooms will provide you countryside peacefulness and charm. You will also make the most of the nearby lively resorts such as Courseulles sur Mer, Ouistréham or the famous Arromanches artificial harbour. Isabelle and Frédéric know and love their region, they will be delighted to help you discovering the fascinating history of D-Day, the epic conquest of William the Conqueror, Normand treasures and local restaurants. See you soon at « The Four Seasons » !